This is a solid, jammy red that offers forward notes of black plum, cherry and berry with touches of spice, violet and milk-chocolate brownie to sweeten the deal. The medium-weight mouthfeel is direct and attractive, as the juicy black-fruit flavors are complemented by moderate tannins and balanced alcohol with a quick finish that ends clean. A medium bodied wine with ripe red fruit aromas and hints of violet followed by a smooth palate of ripe plum, cassis, and pepper. Well integrated tannins on the finish. A medium bodied wine with perfumed plums on the nose leading to a smooth palate of blackcurrant and dark chocolate. With a gentle texture and soft tannins, hints of liquorice and spice linger on the finish. A fresh, crisp wine with tropical fruit and melon character on the nose and palate. Generous mouth feel is paired with crisp acidity. This Sauvignon Blanc shows lovely tropical fruit and melon notes with generous mouth feel and crisp acidity. Exclusively available at Trader Joe's. A 40% Shiraz, 30% Cabernet Sauvignon, 30% Pinotage blend that releases intense aromas and generous fruit flavors, this blend presents soft tannins and a smooth finish on the palate. Exclusively available at Trader Joe's. A light and vibrant colored Rosé with delicious fruit forward aromas followed by a lingering fresh crisp pallet. A blend of Pinotage, Shiraz and Cabernet Sauvignon with Pinotage dominating this vibrant but balanced blend. A robust dark red wine with a full-bodied tannin structure, intrigued with complex dark red fruits that is complimented with ripe berries, sweet spices, mineral notes and hints of dark chocolate shavings with a smooth velvety finish. White and pink floral tones of clover and sweet pea waft from the glass on first nosing, with supporting tones of white pear, melon rind and green apple. Gooseberry and pineapple flavors unfold on the palate, framed by ample acidity that results in a short yet clean finish. 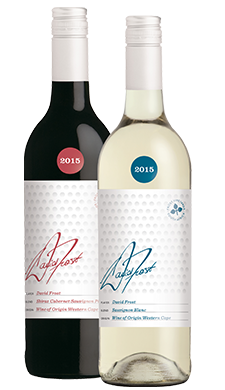 Brand new to the David Frost wine collection this blend oozes a gentle nuance of berries with soft black fruits and brushes of spice on the nose. 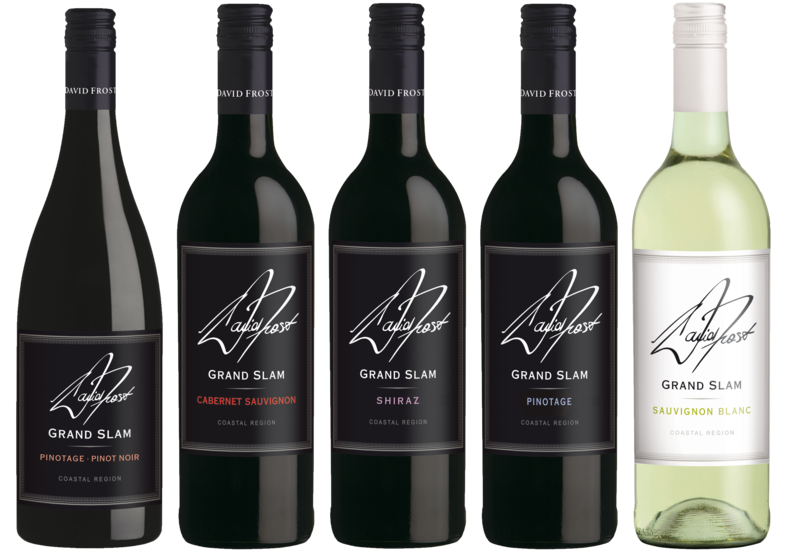 Expressive bright plum and berry are immediately obvious on the palate. Medium-bodied, juicy, and lively with well restrained oak usage. Delicious & soft-textured with surprising length and complexity. Wine label painted by the late artist Leroy Neiman, best known for his illustrations that presented scenes of sports and entertainment and the people that brought those pastimes to life. The 2000 Merlot Reserve was dedicated to one of golf's greatest, Gene Sarazen. A full bodied powerful wine with ripe prune and cassis aromas, sweet fruit and dry tannins result in a long pleasant finish. For purchase information - please fill out the contact form. Wine label painted by the late artist Leroy Neiman, best known for his illustrations that presented scenes of sports and entertainment and the people that brought those pastimes to life. The 1999 Merlot Reserve was dedicated to one of golf's greats, Arnold Palmer. This Merlot is concentrated with rich chocolate and coffee aromas with flavors of blackberry, cherry and spice on the palate. The finish is focused and lush with soft underlining tannin firmness. For purchase information - please fill out the contact form.